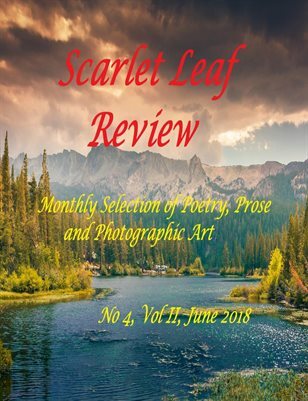 After a long hiatus (almost two months and a half), a new issue of Scarlet Leaf Review is live. It is a longer issue because of the number of submissions that were accepted for the months or February and March and for a moment there, I didn’t think I could do it in due time, honestly. As always, Weebly seems to have a problem with our magazine and I post something, and yet, something else appears!!! And, if I skipped over some errors – like a big photo, a garbled category, don’t take it personally, just let me know. I’d like to offer a huge thank you to the authors who have contributed to this issue as well as to the authors featured in the past issues. Although no new material was posted, the numbers of hits kept being high. As I stated in January, because of you, the site had 1,673,798 hits between January 15, 2016 and January 15, 2018. The month between January 14 and February 15 saw 97,843 hits, February 15 to April 14 inclusively, 158,268. As result, we are very close to 2,000,000 hits (only 1,929,902 right now – but I am confident we’ll get there in April). On April 21st, the print issue of the review will go live as well. If you click on the MacGloud widget on the home page, you are directed there. We are thinking on issuing a new print version Scarlet Leaf Review’s Treasure Chest, with two versions – Poems and Stories, which will feature only 3 poets, respectively 3 writers per issue. Who is interested, please, contact me, and I will outline the possible advantages and conditions. Don’t forget, if you hover with your mouse over FEB-MAR-APR 2018, you find the drop-down menu, showing poems, short-stories and nonfiction. If you want to read the work of a specific author, click on the author’s name, on the right hand of the page under categories.